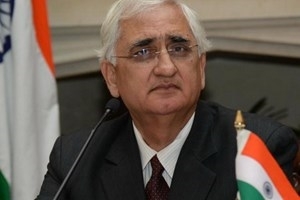 Vietnam has become a pillar of India’s “Look East” policy, according to Indian Foreign Minister Salman Khurshid. Indian Foreign Minister Salman Khurshid (Source:Topnews). The minister granted an interview to Vietnam News Agency reporters on the occasion of the upcoming visit to India by the General Secretary of the Communist Party of Vietnam Nguyen Phu Trong from November 19 – 22. He stressed India’s belief that the visit will mark a turning point in the two countries’ strategic partnership, which was built by late President Ho Chi Minh and late Indian Prime Minister Jawaharlal Nehru, and treasured by following leaders and the two peoples. In recent years bilateral ties have recorded positive developments in depth, he noted. The minister said both sides have made important progress in the five cooperation pillars of politics, defence and security; economics and trade; science and technology; culture and technique; and regional and multilateral issues, which were set in their statement of strategic partnership establishment. He added that India and Vietnam have also implemented a number of significant initiatives in each field, affirming that their cooperation relations have become stronger than ever. Minister Salman Khurshid said there remains potential for both countries to expand their ties. This year, two-way trade has rose 40 percent, he said, expressing his belief that the figure will hit 7 billion USD in 2015. India’s investment in the Southeast Asian country has surged, and many Indian enterprises are willing to run their businesses in Vietnam . The minister deemed science and technology, information technology, biotechnology, agriculture, space and the use of nuclear energy for peaceful purposes as areas that need special attention. He also said the planned establishment of a Vietnam - India direct flight route will create a major driving force to their businesses, tourism and exchange activities. Vietnam and India established their diplomatic ties in 1972 and elevated their relations to a strategic partnership in 2007. The Press Trust of India (PTI) and other local media agencies such as UNI, IBNL, NetIndian and Business Standard, have carried many articles highlighting the coming visit to India by General Secretary of the Communist Party of Vietnam Nguyen Phu Trong from November 19-22. They underscored that Mr Trong’s visit will help strengthen the ties of traditional friendship and cooperation between the two countries in the future. Indian news agencies quoted the Indian Foreign Ministry’s press release as saying that Prime Minister Manmohan Singh will hold talks with Vietnamese Party leader Trong on the two countries’ strategic partnership. Vietnam and India have established closed relations on the basis mutual benefit, understanding and trust, as well as effective cooperation in recent years, they said. During his visit, Mr Trong will pay his courtesy visit to Indian President Pranab Mukherjee, and have meetings with Deputy PM Hamid Ansari, speaker of Lok Sabha (the Lower House of the Parliament of India) Meera Kumar, Indian Foreign Minister Salman Khurshid, and leaders of the ruling parties. The Vietnamese guest will also visit Mumbai city and meet with the Governor of the Maharashtra State and representatives of the Indian business community. The upcoming visit by General Secretary of the Communist Party of Vietnam (CPV) Nguyen Phu Trong to India is expected to help expand and deepen the strategic partnership between the two countries. The State visit from November 19-22 was made at the invitation of Indian Prime Minister Mamohan Singh. It aims to help Vietnam strengthen its close relationship with India and expand ties between the Vietnamese Party and Indian political parties, the two national assemblies and peoples. Such relations were built by late President Ho Chi Minh and late Indian Prime Minister Jawaharlal Nehru, and treasured by following leaders. The visit also means to intensify the pillars of the strategic partnership that has existed between both sides since 2007. The Indian Government considers Vietnam a key component of its “Look East” policy. In addition to sharing a lot of similarities and mutual benefits, both nations also support and cooperate with each other regularly as well as exchange views on various issues at regional and multilateral forums. As of June this year, India was ranked 30th out of 101 nations and territories investing in Vietnam, with 73 valid projects worth over 253 million USD in the Southeast Asian nation. Two-way trade was recorded at 2.2 billion USD in the first five months of this year and is expected to hit 7 billion USD by 2015.